Cutaway diagram of the Armstrong Inverted Bucket Trap. The inverted submerged bucket steam trap is a mechanical trap that operates on the difference in density between steam and water. Steam entering the inverted submerged bucket causes the bucket to float and close the discharge valve. 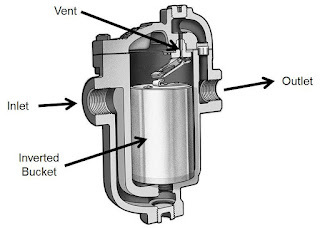 Condensate entering the trap changes the bucket to a weight that sinks and opens the trap valve to discharge the condensate. Unlike other mechanical traps, the inverted bucket also vents air and carbon dioxide continuously at steam temperature. 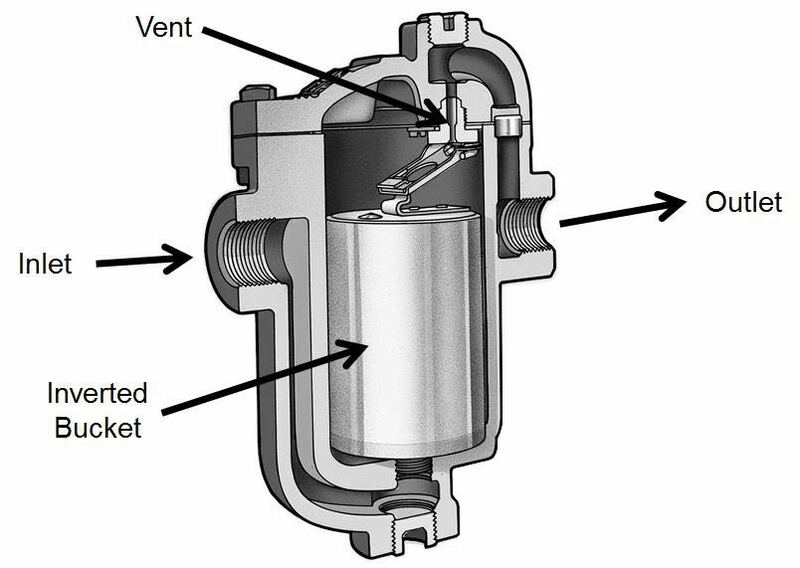 This simple principle of condensate removal was introduced by Armstrong International in 1911. Years of improvement in materials and manufacturing have made today’s Armstrong inverted bucket traps virtually unmatched in operating efficiency, dependability and long life. For more information on Armstrong steam traps, visit http://www.meadobrien.com or call (800) 892-2769.